← Why would anyone listen to these people? Just links. My own thoughts are much like teacherken’s (below). I’ll add that the charters/merit pay agenda does not make me happy but balance that by saying that at least the merit pay pilot in Chicago included peer evaluations along with test scores. The New York Times, Schools Chief From Chicago Is Obama’s Choice for Education. 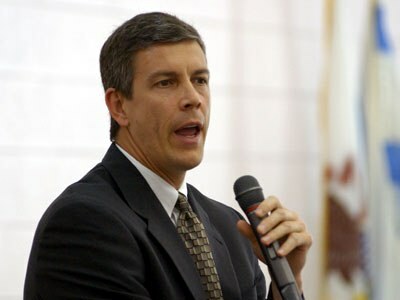 teacherken, Arne Duncan as Sec Ed – it could have been worse. Alexander Russo, District299: The Chicago Schools Blog, Duncan Pros and Cons. Greg Palast, Obama’s “Way-to-Go, Brownie!” Moment?. Education Week, Duncan is Obama’s Education Secretary Pick. Good discussions in the comments at all but the NYT.